Samsung, as Apple, aims to keep its main services closed and exclusive use only for the same devices of the brand. An example is Samsung Pay, the Korean company's own payment platform that, so far, is only available for Samsung devices such as cell phones and smartwatches. 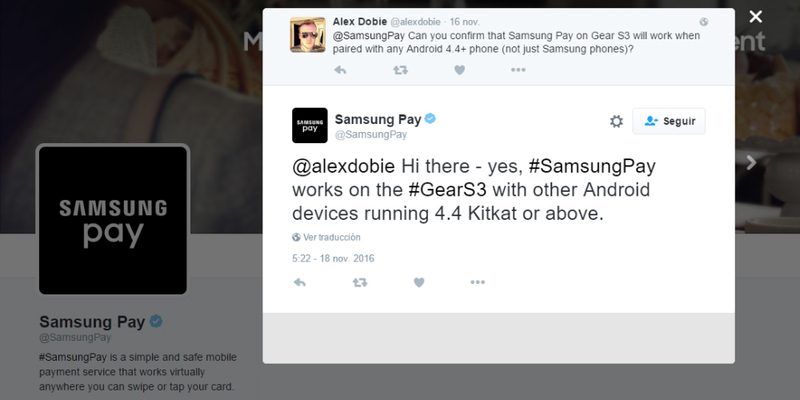 But it seems that things are changing little by little, and according to an official account of Samsung Pay on Twitter, Gear S3 will be able to make payments using Samsung Pay also in cases in which the device is paired to any other smartphone of any other brand, based on the Android 4.4 KitKat version or higher. The confirmation on Twitter makes us foresee the existence of an extension to support compatibility of the payment services in the mobile devices of other brands, until now not valid to make a payment using such application. We recall that the Samsung Gear S3 was recently launched in the European and American markets through the usual distribution channels of Samsung Electronics for mass selling. This wearable includes as an operating system the Tizen platform and a new application created specifically for mobile devices and called Samsung Gear Manager, as well as other offers. In fact, until December 15, 2016, users of a Samsung Gear S2 or Gear S3 will be able to take advantage of an added incentive that will greatly contribute to improving the user experience and writing through the platforms mentioned, as they now have the ability to download the new TouchOne Keyboard for free. This is not a simple keyboard, but it has a predictive method derived from a new implemented algorithm that allows to write easily and without problems, giving space for the insertion of emojis without reducing the field of vision offered to the user and without requiring long periods of time to perform spelling corrections. To better understand the potential of the new product, we leave you with a link to the explanatory video that highlights the characteristics and potential of the new integrated system for writing texts through the smartwatch.